Holds 1pr. chu bachi + 2 pr. shime bachi. When closed, bachi fit completely inside bag for full coverage protection! Bottom Wear-panel: If selecting from the Yukata fabrics, No Charge. Color: Select from any of the available Yukata fabrics only. Want to outfit your ensemble with matching hachimaki? Ask about our group discount. Holds 2pr. chu bachi + 2pr. shime bachi + 1pr. tapered bachi. 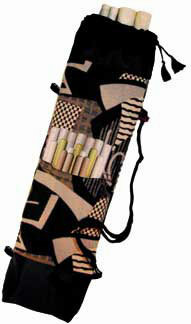 For Yoga Mats: Holds one standard, rolled, yoga mat. Top entry makes for quick and easy selection. Nylon lined for extra long life and weather resistance, plus "no snag" bachi entry. Bottom reinforced for years of long wear. Holds 2pr. odaiko Bachi, and a ridiculous number of chu, shime, tapered bachi, and other gear. or use the front section for your tabi and water bottle! Bottom and top are reinforced to add years of long lasting wear. Double side-loop tabs let you carry bag right/left shoulder or as backpack! Note: this is not a stock item, and may take some time to fill order. Bottom Wear-panel: Standard feature of XL bags, No Charge. Always have a bachi at hand! Designed for performance use and travel. 2-Compartments holds 2 pr. shime bachi, 1 pr. chu bachi, and 1 pr. tapered bachi. 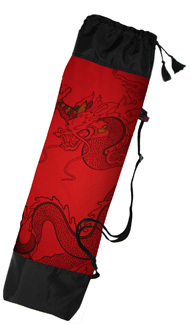 Color: Contrasting color panel with Heavy Black Nylon body for performance use and superior wear. Same idea as the Travel Ready Bag but priced with groups in mind. One "Stay-Open" compartment is designed for performance use. Holds: 1 pr. chu bachi and 1 pr. tapered or shime bachi. Color: Heavy Black Nylon for performance use and superior wear. 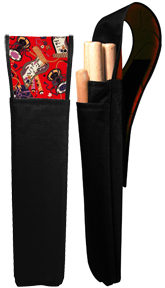 Custom: Sized for odaiko bachi, or special-fitted for a particular stand +$10. Basic Ready Bag on Naname Stand. © 2006 Jedlicka Design Ltd -- All rights reserved.